Gulfnews: Whistle-stop tour! Gulfnews: Whistle-stop tour! Last updated: 23:59 (GMT+04) Thursday, December 11, 2008. Muharram 9, 1430. If you think it is rude to whistle, well in some instances it indeed is. But when expert whistlers get on stage and extract songs from the wind, it's a show-stopper, says Mythily Ramachandran. There are times and occasions when whistling is totally unacceptable and is to be condemned. But when it is stripped of its unsavoury connotations and becomes a musical hobby that can captivate an audience, it can be given ungrudging respect. A small but growing group in India is taking whistling to new heights – even forming an association called the Indian Whistlers Association (IWA). Meet Pune-based 22-year-old Rig Veda Deshpande. For him, whistling is a musical talent and he sees it as a hobby that is just as demanding in its skills as any other form of making musical sounds. In fact, Deshpande has decided to break the mould and is encouraging women to go up on stage and allow their talent to emerge as lilting tunes. So popular have Deshpande and the Association become that in August, 2007, an exclusive women's whistling show was conducted complete with a live orchestra in Chennai. Seven women were on stage whistling tunes from Tamil and Hindi films. Friday met up with a few of them after the event. Pallavi Shreedhar, an engineer from Bangalore, set the mood rolling with a popular Bollywood hit song from the '70s and there was no looking back for the audience who had the time of their lives as lilting tunes rent the air. Fifteen-year-old Shweta Suresh, a Bharatanatyam dancer and singer performed a Tamil song. Though Shweta's talent for whistling has been a bone of contention with her parents, she refuses to be cowed down by their disapproval. The day she heard of the IWA was one of the happiest days of her life. But it is not just the young and trendy who are giving this lung power a new dimension. There was Dr Lakshmi, a radiologist from Bangalore, who went on stage during the all-woman show and had the audience on their feet dancing to the tune of a classical chart-buster from a Hindi film Guru. (The song was Barso Re Megha or 'Rain down, oh clouds'). Then there was Pallavi Patrutkar, a software professional from Pune, who led listeners down memory lane with a nostalgic Lata Mangeshkar number O Basanti. The show was a fundraiser organised by IWA for Probus Club, a meeting ground for senior citizens in Chennai. The show raised Rs400,000 (around Dh38,000) to support the education of the under-privileged children in Chennai. The women's show came close on the heels of the first Annual All India Whistling Convention of IWA held in Chennai in July, 2007. Whistlers from almost all over India including Pune, Mumbai, Delhi and some cities in Kerala came together in a show of camaraderie and pure talent that left the audiences screaming for more. The competition was conducted in two categories; for beginners and experts. Deshpande, who has awarded himself the title of a 'maverick whistler' designed the trophies which are shaped like chess pieces and created in acrylic by Jagat Tarkas, who manages a sports goods business and is the South Zone head of IWA. At the convention, West Zone walked off with top honours. The two-day event culminated with 48 IWA members whistling a patriotic number thus making their entry into the Limca Book of Records (India's homegrown version of the Guinness World Records). Young Deshpande is your friendly next-door guy with an infectious smile. "My father often whistled at home. I guess I picked it up from him," he says of his hobby. From his school days, he realised that he had a talent to mould air into a musical number. "Initially, my whistling was too shrill and not very steady. So somewhere along the way I gave up." But when he was in Class XII, he found himself having new confidence. At the Lucknow Christian College in Lucknow (the city in which he grew up) he used to perform at undergrad parties and his talent earned him a lot of appreciation. "In fact after watching one of my performances, the principal of the college encouraged me to perfect my hobby and aim to perform at bigger musical functions." Keen to develop his talent, he got in touch with whistlers around the globe, via the orawhistling forum, an online community of whistlers. "This group takes whistling seriously. There is a quality in their whistle and they are a dedicated lot. I was not satisfied being my own audience. I wanted to give this musical form a bigger platform and encourage others to step forward and hone their skill." But in a field that is largely considered a social menace in India, how to find the right people who considered this as a musical talent? A Google search located 40 dedicated whistlers in India. Deshpande e-mailed them all – his idea was to create an online group of Indian whistlers. Chetan Bhide, 30, now a Pune-based lawyer, was the first to join the group. "I was surprised to one day see a message from Deshpande. Until then, I believed that I was the only one passionate about whistling," he says. "When Deshpande came to meet me, I was quite amused. He was in his late teens and very enthusiastic about forming a group," say Bhide. In 2004, Deshpande and Bhide founded the group on Yahoo with just the two of them as members. On December 14, 2005, Deshpande (a great one for remembering dates this young man) received a call on his cellphone at 8.30 in the morning. The caller was Jagat Tarkas, a businessman from Chennai, who introduced himself and said he would like to join their group. "I asked him to whistle a few bars over the phone but he insisted that he would travel all the way from Chennai to Pune and prove his talent. I wondered whether this guy was crazy to come all the way just to prove that he could whistle,'' laughs Deshpande at the memory of the phone conversation. 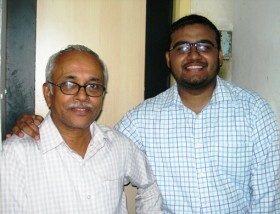 But Tarkas kept his word and met up with Bhide and Deshpande in Pune. "Jagat was in his fifties but all charged up and very positive about forming IWA,'' says Bhide. "He had a plan in mind. He wanted us to perform on stage. Until then we whistlers were only exchanging e-mails and it was getting us nowhere." Thanks to Tarkas, IWA was launched. For the 59-year-old businessman, IWA filled a void in his life. A fairly good singer, Tarkas was better known among friends as Mohammad Rafi, the legendary Bollywood singer of India who passed away in the '80s. "However, a few years ago, my throat got affected and I could not sing properly anymore.'' But his love for music was unstoppable and he decided that if he could not sing, he would whistle. "These words began to haunt me," says Tarkas. He decided he would pursue something that was truly close to his heart. And the one thing that he really cherished was whistling. Tarkas convinced Deshpande to bring together other interested whistlers in India and in 2006, they organised the first show in Chennai. The show brought together all true-blue whistlers for whom it was a passion of melody and skill. People of all ages began to show up, says Deshpande. So popular was the event that a second show was held in August that year in Bangalore. Tamil songs were introduced at the Chennai show in April 2007. Soon new talent trickled into the group and today, IWA boasts 370 members with 80 whistlers from Tamil Nadu alone. Deshpande redesigned the IWA website which was officially launched in 2007. So far, IWA has survived on personal ontributions by Deshpande and Tarkas. Its biggest supporter is Deshpande's mother, Minal. She is also his harshest critic. The act of whistling, say its practitioners, helps destress a person, because it involves breath exercises which improve lung power. "When it comes to whistling, you don't need to carry any instruments with you. We call whistling the flute without the bamboo," says Deshpande. He believes that whistling is an art like any other form of music. Looking ahead he says, "Maybe a couple of years later, IWA will make its presence felt on Indian television. We are scouting for talent." The next milestone is to host the International Whistler Convention of 2010 in Chennai. "The only criterion to qualify for the competition is that you must be able to whistle a Western classical tune," says Deshpande. He then comes to the topic of why whistling has got such a bad rap. True, it is considered poor etiquette if done out of context. He has a few rules which he hopes will restore this musical talent to its original status. "First, please observe the etiquette for whistling. When you whistle to yourself, especially while walking on the road or driving, do not look at anyone. Also keep in mind the privacy of others," says Deshpande. "Sometimes, it is better to simply remain quiet." He is clear about one thing, though, "We are keen on erasing the image of a whistler as a social menace or an individual lacking in manners or etiquette." – Mythily Ramachandran is a Chennai-based writer. - More info on http://www.whistleindia. What's a pizza got to do with your job?